Purchasing a diamond can be tricky – but it's all about understanding the different elements which make up a diamond and your own preferences. The first step is to understand the four C's – Cut, Colour, Clarity and Carat. 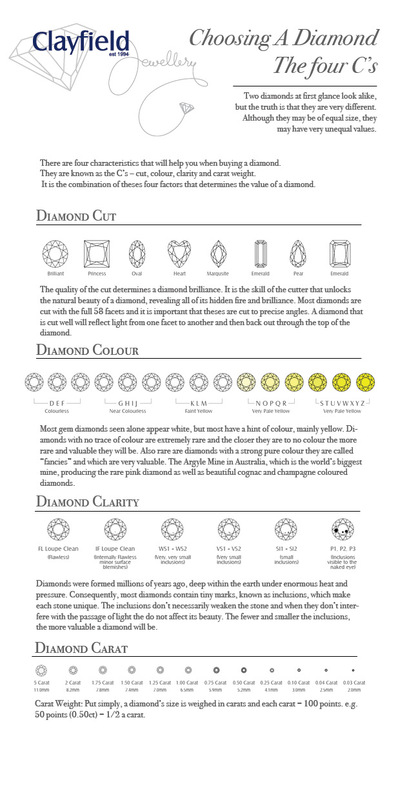 Below we have a handy infographic to give you an easy run down of the different elements to look out for and help you decide on what sort of diamond is right for your piece! One of the first things men will learn when considered a ring is the 4 C’s. It’s the measure by which a piece of diamond jewellery is measured and valued. The quality and standard of each of these four elements combined are added up to make the price. The rarer the quality, the higher the value will be of the ring. If men aren’t aware of colour preference, they are advised to make selections based on how the ring ranks according to the other qualities. Certain questions are taught to the guys to ask such as how precise the cut is, how clear the stone is, and how many carats the stone can be measured in. These questions help men make a better informed decision, no matter where they do their ring shopping. 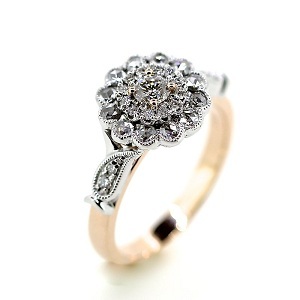 For the ultimate gesture of romance and affection, some guys seek the advice to custom create their own ring. Custom jewellery sounds like a difficult and costly method, but the process is broken down for the guys as they investigate what settings work with what stone, what styles are easier or harder to replicate, and what is possible with what type of metal. Custom jewellery doesn’t have to be complicated, which is why jewellers like to educate the public on the actual process of designing and creating these unique pieces. The price is always going to be a sore spot for the guys, so the jewellers of North Brisbane like to advise to stick to a budget. 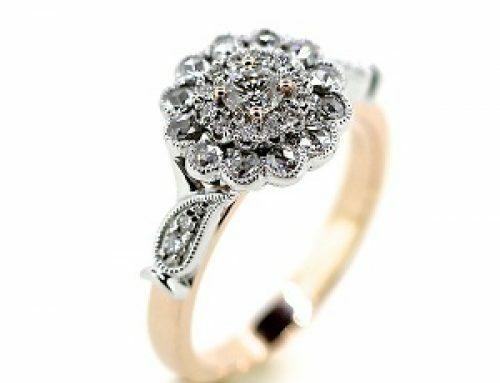 If a ring can’t be had within the budget, it’s best to consider other options that would work instead. It helps for the financial peace of mind for the guys, but also for the jeweller to suggest the right ring for the price in question. Guys can be put under the pump when it comes to picking that perfect ring. With just a little education from the experts, they can make an informed decision and choose something that will make the engagement a memorable experience for all.